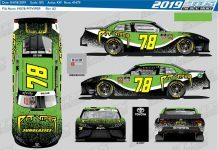 KANSAS CITY, Kan. – Amid rampant talk of needing to search for a full-time ride next season, John Hunter Nemechek proved to the masses on Saturday that he can race and win against the best of them. Nemechek broke through on Saturday and scored his first NASCAR Xfinity Series victory courtesy of a huge late-race rally. Driving the No. 42 Chip Ganassi Racing Chevrolet, the 21-year-old charged from sixth to first following a restart with 32 laps to go and left the competition in his dust from there. 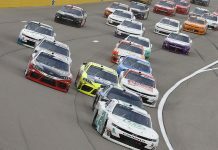 The second-generation driver opened up a massive 5.2-second margin over runner-up Daniel Hemric en route to victory at the same track where his father, Joe Nemechek, swept the weekend in 2004. That led to an emotional post-race burnout and a choked-up driver in victory lane. 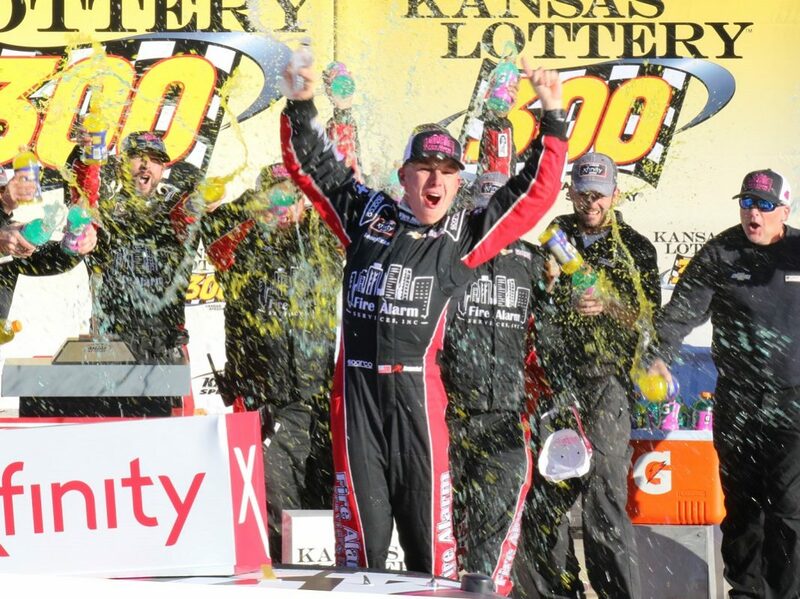 “Man, winning anywhere means a lot, but especially here at Kansas,” noted Nemechek. “In 2004 … I forget how old I was (seven), but Dad swept the weekend in the XFINITY and Cup Series. It’s pretty special to come back here, on the same weekend, and do this here today. Considering Hemric and Nemechek split the first two stages of Saturday’s race, it seemed apparent that the battle for the win would come down to the two of them as well. 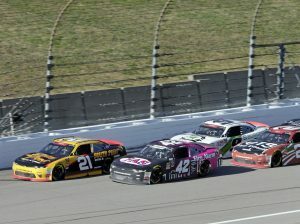 The battle actually began during the second stage, when Nemechek soared around Hemric to take the lead on lap 60 and never looked back, reaching the green-checkered flag first after Hemric had wired the field in the first 45-lap stage of the day. Hemric won the race off pit road ahead of the start of the final stage on lap 98 and capitalized on gaining control of the race, jetting out to a comfortable margin early in the second half but having to drive smart as the laps ticked away, with Nemechek getting better as the run went on and closing back in. The two were separated by mere car lengths when they ducked onto pit road for their final green-flag stops with 50 to go, but Nemechek made a crucial mistake when he slid the nose of his car entering the stall, having to back up and losing precious seconds for landing just an inch over the line on pit entry. That meant that when the stops cycled back out, Nemechek was more than three seconds back of Hemric and seemingly out of contention, but the young gun kept his head down and kept fighting. That resolve was rewarded when the final yellow of the day waved with 37 to go, a stalled Vinnie Miller leading most of the frontrunners to come back down pit road for their final set of tires. Nemechek knew, at that point, he had an opportunity to make up for his miscue. Nemechek was correct in that assessment. 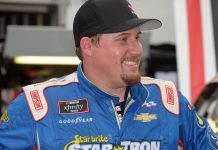 He restarted on the outside of the third row, was running third in less than a lap and had dispatched Elliott Sadler for second one circuit later, when Hemric retook the race lead. After that, a dip to the inside and a side-by-side war was all it took before Nemechek pulled clear for good with 28 laps left. Saturday’s win was Nemechek’s third top-five and fifth top-10 finish in his last six starts. For reference, he’s only made 15 Xfinity Series appearances in his young career, all coming this season for Ganassi. By virtue of the No. 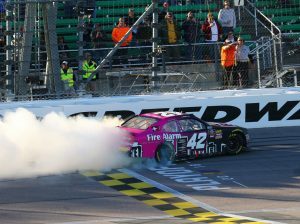 42 team’s sixth win of the year, they also receive an automatic berth into the Championship 4 of the owners’ standings and will be fighting for a title at Homestead-Miami (Fla.) Speedway next month. Nemechek will be behind the wheel of the car for the final three races in 2018. After leading a race-high 128 laps, Hemric faded late but hung on to finish second in the race over Sadler, who gambled on a two-tire call for track position before the final restart and came home third. Shane Lee and Tyler Reddick completed the top five. Matt Tifft was sixth ahead of Ryan Reed, Ty Majeski, Ryan Sieg and Jeremy Clements. The playoff picture was scrambled after a multi-car accident on the opening lap that collected Christopher Bell, Justin Allgaier, Austin Cindric and Cole Custer in its wake. Only Custer was able to continue in the race, with all four finishing 26th or worse in the final rundown.